So I love grinding Hero Merit using auto battle strats. When Developer Maps return I'll be all over them with methods using all kinds of units. I've also discovered some strats for Blessed Gardens, which provides the same amount of Hero Merit but naturally requires blessings on all units that enter, and that's not very friendly to the idea of grinding Hero Merit for units you can't see yourself using. With the removal of stamina costs for Hero Battle Special Maps, these are a newly viable method of grinding. So let's band together and build some strats. Garden of Water - Grotto Auto Battle Strat. Units (Left to Right): Fjorm, Masked Marth, Summer Frederick, Summer Xander. Distant Defense 3 seal on Xander, Hp+3 on Frederick, Attack +1 on Fjorm. Fjorm is neutral and has her natural skills in addition to reposition. Summer Frederick is +Atk/-Res and has speed refinement and Darting Blow 3 and Glowing Ember. Summer Xander is +Atk/-Spd and has Swap and Lancebreaker. Reposition appears to be necessary. The additional point in attack is needed to defeat the red mage. yeeeaaaah, Masked Marth needs none of those extra skills. Her slot can probably be taken by countless other units that are capable of defeating the axe unit in one round. Frederick needs 39 speed to double Charlotte. Mine reaches 42. Glowing ember never procs and as such is not needed. The HP boost from the seal and his weapon refinement is necessary to avoid getting killed. Neither swap nor lancebreaker appeared to be necessary. Removing swap did change who got attacked, but it was still a win. The distant defense seal keeps him alive under a variety of conditions. Bridal Cordelia 42HP/51Atk/39Spd/21Def/24Res. Base Skill set. Bridal Charlotte 55HP/54atk/34Spd/27Def/21Res. Base Skill set. Axe infantry 50HP/48Atk/33Spd/32Def/27Res. Silver Axe with pivot, Res+3, and Spur Def. Garden of Wind - Grotto Auto Battle Strat. Units (Left to Right): Palla, Ursula, Guunthra, Brave Lyn, No seals equipped. Ursula just needs her natural skills. Reposition changes unit movement a bit, but the result is the same. Brave Lyn does not need or use reposition. Horse!Chrom can replace Brave Lyn. Bridal Lyn 46HP/38Atk/37Spd/26Def/27Res. Base skill set. Bridal Ceada 39HP/46Atk/36Spd/21Def/35Res. Has Seal Atk. Bridal Charlotte 55HP/54Atk/35Spd/27Def/21Res. Has desperation. Bridal Cordelia 42HP/51Atk/39Spd/21Def/25Res. Has Death Blow. Garden of Earth - Arbor Auto Battle strat #1. Units (Left to Right): Legendary Ike, Inigo, Ephraim, Kagero. No seals equipped. Legendary Ike is neutral and has all of his natural skills, as well as Swap. Inigo is +Res/-Def and has Gronnraven (not the plus version) and HP+3. Ephraim is +HP/-Spd and has his unique weapon refinement, Earth Boost, Lancebreaker, and Hone Speed. Kagero is +Spd/-Res and has no SI. Inigo just needs Hone Atk and the ability to dance. Ephraim definitely needs lancebreaker 3 and possibly Hone speed (see: Kagero), but not his weapon refinement or Earth Boost. If your ephraim is - Def or -HP, a defense boost of some kind may be necessary. Kagero must reach 38 speed for Turn 1. She can get it from a combination of a speed seal and Life and death skill. Hone Spd from Ephraim's unit slot (skill or seal) can also serve as a substitute since she only needs a speed boost for the first turn. Clair 44HP/44Atk/40Spd/27Def/36Res. Base skill set. Faye 49HP/44Atk/27Spd/28Def/34Res. Base skill set. Lucas 52HP/46Atk/24Spd/47Def/18Res. Base skill set. Alm 52HP/55Atk/33Spd/30Def/24Res. Base skill set. Garden of Earth - Arbor Auto Battle strat #2. Units (left to right) Legendary Ike, F!Grima, LA!Eliwood, Kagero. HP+3 seal on Ike, Close Defense 3 on Kagero. Grima is +Res/-Atk and has her base skills. Eliwood is neutral and has his base skills. Ike never uses Swap, so it's not needed. The HP seal is meant to keep him alive. Eliwood has no SI. Rally Atk or Atk/Def keeps him from engaging in any combat. Giving him the armored boots seal and not having Rally equipped causes him to attack, and still results in a win if you didn't have him learn Rally or want him to get kills. Kagero must reach 38 speed for Turn 1. With neutral speed and her seal slot taken up, she will want either Spd+3, Darting Blow 2 or Hone Spd 2 seal on Eliwood. The Life and Death skill leaves her too weak to survive hits. Garden of Fire - Statuary (Almost) Auto Battle strat. Units (left to right) Faye, Brave Ike, M!Robin, Katarina. Instructions: Move Ike one space up. End turn. Engage auto battle on turn 2. Robin is +Def/-HP and has Reposition, Triangle Adept 2, and Swordbreaker 3. Katarina is +Spd/-Def and has no SI. Faye needs G Tomebreaker to kill Camilla. My Ike needed an Atk+1 seal to kill Lucina due to his -Atk nature. Any Archer packing a brave bow or fast enough to double Camilla should work. Faye is probably the least optimized archer for the job, lol. Raven with Close Defense 3 seal, Fury and a non-refined Basilikos gets the job done, but you'll need Katarina's slot to have spur spd and be placed next to him on turn 1, or otherwise have a +Spd Raven. Raven also seems to ignore lucina when he has a chance to kill her, so the whole strat probably has to be done without auto battle as far I can tell. What you need is a unit bulky enough to survive both Lucina and Chrom. Deflect Magic seal can help with lucina. I also think Dorcas may be the best substitute for this strat, but I don't have him to try it. Units (Left to Right) - 4*Donnel, 5*New Years Corrin, 4*F!Robin, 4*Laslow. Confirmed Unit replacements. All are four star unless stated otherwise. Laslow can also probably be replaced by anything, though his slot tends to take more hits. Navarre Lunatic Difficulty Auto Battle strat. 5.0 HM per unit. Units (Left to Right) - 4*Laslow, 4*Lissa, 4*Oliver, 4*Cecilia. Deflect Magic 3 seal on Laslow. Spur Res 1 seal on Lissa. Unequip Lissa's weapon. Confirmed Unit Replacements. 4 star unless stated otherwise. Wrys can replace Lissa. Just remember to unequip his weapon. F!Robin Hard Difficulty Auto Battle strats 3.1 HM per unit. Units (Left to Right) - 4* Gaius, 4* Arvis, 4* Niles, 4* F!Robin. Speed +2 seal on Arvis. Spur Res seal on Niles. Unequip Rally Speed from Gaius if he has it. Niles needs his whole base kit, except for Warding Blow 3 and Spur Res 2. Matthew and Saizo can replace Gaius. Units (Left to Right) - Physic healer, Black Knight, filler, filler. All units except Black Knight have weapons unequipped. Black Knight needs Vantage 3 and Attack +3 seal. Healer needs either Hone Attack 3 or Hone Spd 3 seal or skill. Clarisse Lunatic Difficulty Solo auto battle strat. 5.0 HM per unit. Units (Left to right): Filler, Legendary Ike, Filler, Filler. Ike can get by on his base kit, but giving him Vantage and the Quick Riposte seal can expedite the battle. Make sure the filler unit in slot 3 can survive a round with the sword cav. Certain compositions of filler units might also bait the blue mage to come around the right. If that is happening, try to modify units and their positions until he behaves. Ursula Lunatic Difficulty Auto Battle strats 5.0 HM per unit. Units (Left to Right) 3*Oboro, 5*Lyon, 5* Klein, 5* F!Robin. Robin needs to upgrade to keen gronnwolf and have the Distant Defense seal. Lyon needs Triangle Adept 3. And Klein needs Swordbreaker 1. His AI only seems to behave with that skill. Units (Left to Right) Filler, Filler, Filler, W!Chrom. All units except Chrom have unequipped weapons. Chrom has Slaying Axe with MT refinement, Aether, Distant Counter, Wary Fighter, and Close Def seal. Units (Left to Right) Filler, Healer, Filler, Black Knight. All units except Black Knight have unequipped weapons. Black Knight has Vantage 3 and speed +3 seal. The healer must have both Physic and Imbue, and must be capable of surviving a round with Ursula after taking 7 recoil damage from Savage Blow. Unit replacements: The healers I've gotten this to work with are 4* Maria, 4* Sakura, 4* Wrys, 4*Lachesis with Distant Def seal, Genny with Distant Def seal. Remember that you can pack your first filler unit with a useful seal like Spur or Hone Spd. Units (Left to Right) Filler, Filler, Gunnthra, L!Ike. All units except Ike have unequipped weapons. Ike needs Quick Riposte and the Distant Defense seal. Units (Left to Right) NY!Corrin, LA!Eliwood, filler, filler. Filler units have weapons unequipped, and one of them must be either a flier or cav. Corrin has his assist unequipped and Def Tactic 3 seal equipped. Eliwood has Rally Attack, Spur Attack 2 and Distant Defense 3 seal equipped. Unit replacements: Can confirm 5 star Michalis can replace minerva with his base skills and Quick riposte seal. Units (Left to Right): Legendary Ike, Filler, Filler, Xander. Ike needs Threaten Attack 2 and Defense seal. Xander needs Ignis, Quick Riposte skill, and close defense seal. Units (Left to right): 4* Matthew, 5* Nowi, 4* Stahl, Filler. Only Nowi has her weapon equipped. Nowi has a +Def refined weapon with quick riposte 2 and the close defense seal. Matthew is here to use reciprocal aid, and Stahl tanks a hit from the red infantry. Unit replacements: 4* Donnel can replace Matthew. Probably any unit with reciprocal aid or a healer will get the job done. 5* A!Tiki can replace Nowi with quick riposte 2. But you need to equip her with Obstruct 2 seal. Units (left to right): Filler, Filler, L!Ike, Spring Lucina. Filler units have their weapon unequipped. Ike can get by on his base skills. Units (left to right): Filler, A!Tiki, filler, filler. All units except Tiki have weapon unequipped. Tiki requires a +Def refinement, Aether, Steady Breath, Quick riposte 2, Threaten Res 3 and close defense seal. Threaten Res 3 can be replaced by Res Ploy 3 on the first filler slot. I've gotten it to work on my Tiki as well using the +Def refinement, Bonfire, Defiant Atk 3 (base skillset), QR2, and Close Def seal. She also needs Def Tactic seal support from filler units. Units (left to right): Filler, Black Knight, Arden, Filler. Filler units have weapons unequipped. First filler unit must have Def Tactic seal and be either a cav or flier. Arden has Ignis and Threaten Spd seal. Black Kngiht has attack +1 seal. Units (left to right): Filler, 4*Gunter, 4*Ursula, filler. Filler units have weapon unequipped. Filler units must be diverse enough to proc Def Tactic. If filler 1 is an armor unit, give them armored boots seal. Gunter needs Draw Back and Def Tactic 3 seal. Ursula needs blarblade and R Tomebreaker 1. Also give her Fortify or Spur Res 1 seal if Gunter happens to be -Res. Confirmed Unit replacements: 4* Arthur can replace Narcian, but needs the Savage Blow 1 seal. Furthermore, the filler unit in slot 4 must carry the Def Tactic seal and the filler units must be even more diverse to proc it. While I like the idea of a HM grinding threat, I won't give units I don't plan to use a rare blessing. 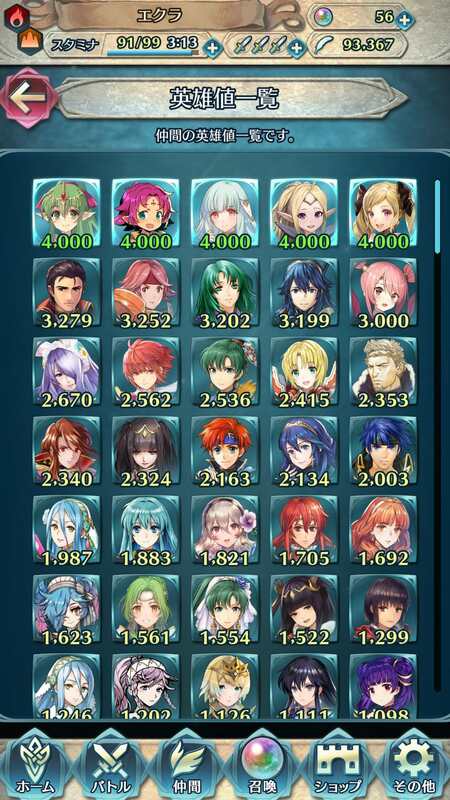 All units you listed are pretty great (perhaps apart the Summer units) and could be grinded (manually or with auto-mode) in TTs, where you could earn additional feathers by ranking. I'll wait for the next developer maps and decide what to do. Armors are very good for auto-grinding and I still don't like to play them manually. I do regret to have auto-grinded Matthew though (too ashamed to tag a certain Matthew fan). My flaunting will follow when I fill the second page with maxed units. Good luck and happy grinding to you! If you're all feeling shy about your HM pages, I'll go and flaunt mine so you can all feel better. Fear my lack of dedication. I can see your dedication to Dark Overlord Elise and Ninian’s kindergarten. My phone cannot upload pictures, but I only have MMarth, Fjorm and Julia tapped out. Although FMorgan did some work in the last TT and is close to being tapped out. My only strategy is TT on auto battle for hero merit with characters who get stat bonus on TT. While I like the idea of a HM grinding threat, I won't give units I don't plan to use a rare blessing. Yeah, but we all have a variety of teams for each element that could lead to a ton of different strats or discovering replacement units for existing strats. For instance, I nabbed F!Grima yesterday and within minutes of raising her to level 40 discovered that she slotted right into Ephraim's and Kagero's spots resulting in a victory despite wildly different AI. The Blessed Gardens I'm also enthusiastic about because these maps aren't going anywhere. While Developer maps are a fleeting opportunity and TTs are random and result in unit deaths just because the final map is always insane and Fir REALLY has to 1v1 that Subaki on Map 1. Whether Fir has uber bonuses or not, she's not taking out Subaki. I'm tired of feeling like I need to keep one eye on the game and override the controls every once in a while. I wanted to disagree to this (so far I conferred only 3 blessings each plus one extra fire blessing because I lack a legendary there) but then I checked my inventory and found more blessings than I remembered (7/12/9/11). I guess I could start with water blessings then... where are those dusty armors? For instance, I nabbed F!Grima yesterday and within minutes of raising her to level 40 discovered that she slotted right into Ephraim's and Kagero's spots resulting in a victory despite wildly different AI. I'm envious of your Grima, a shame you use her for auto-grinding. TTs are random and result in unit deaths just because the final map is always insane and Fir REALLY has to 1v1 that Subaki on Map 1. Whether Fir has uber bonuses or not, she's not taking out Subaki. I'm tired of feeling like I need to keep one eye on the game and override the controls every once in a while. Watching auto TTs will make you go crazy. Just do something else and check your phone from time to time to see if interaction is needed (send in a new team). Well I don't really yet. I've only used her to check if she can sub in for existing strats. All legendary Heroes will be labbed if I can get my hands on them, since they have no choice but to be associated with teams of their element. And despite intentionally pulling for none of them, I've got one of each except Horse!Ephraim. I built a second strat for that map that takes advantage of Ike's natural Def Tactic and Grima's speed boost. This one is still Kagero-centric but doesn't rely on a rare unit like normie!Ephraim. LA!Eliwood could probably be replaced with any armor, since his movement type is necessary for Def Tactic to activate while also keeping said unit out of the fighting. @Glennstavos I used the Winding path in the garden of Earth to grind Summoner support for Cordelia (which was needed for this one turn clear). She happened to be part of my Earth blessing team and L!Ike, Cordelia, BB!Lyn and Myrrh (in that order) had no problems in auto-mode. Everybody (par Lyn) had Reposition, Myrrh had Iote's shield seal equipped. The HM gain was a lesser (2.95) than in the developer maps, but Lyn collected some SP at least. These were very general calculations but i think they give a good idea. All of these approximations were done using a team consisting of 4, level 40 5☆s. welp, I hope everybody found time to flaunt their Hero Merit lists because the cap just got raised to 5000. Tempest Trials also appear to have reduced stamina costs, though they didn't specify how low. That should make that mode even more viable for grinding as well. So, with the stamina changes for GHBs it's now possible to grind HM for free - until IS fixes it. I just checked this with Narcian and it's true! Arden (DB2, Follow-Up Ring, Drive Def 2, Armor Boots, Brave Sword+, Ignis). /Edit2: It seems LA!Eliwood can be replaced by any other armor unit (without assist but with Spur Def seal equiped). Checked with Gwendolyn 4*+6. Yeah GHB maps having no stamina cost is pretty huge. Even if you can only manage something for a Hard Mode map, this is a cool new method. I threw together something quick for a F2P strat, but I hope to have some strats for every day's map. I have rewritten the OP and archived the Blessed Gardens strats. lol Legion's map is a pain but I figured out a F2P 4*strat for Hard. That's a long map to clear because of reinforcements. And my strat requires Deflect Magic 3 which I know a lot of people don't have upgraded. I guess they can't all be winners. Really a lot of these GHB and BHB maps aren't auto battle friendly. Robin's strat is much better. If I can have one good strat for each day, then that's enough. I used WChrom at +0 w/ +def/-res, DC, Wary Fighter, Close Def, Aether, Slaying Axe +mt. I imagine you can use any Green Armored Axe unit with DC, Slaying, and Aether. Use Wary Fighter if you dont have the spd to avoid doubles. Place WChrom or replacement in slot 4 and have slots 1-3 be level 40 w/ no weapons. It would be wise to use units you never plan to build so you can grind their HM up b/c others will grind up naturally. Anyone else have solo builds? Particularly for other days with common units? If they don't patch this in the near future it may be wise to create a sticky just for solo grinding on different GHB days. Yeah I think these could be great. I own a hector, but I'm low on SP to try on different skills to make him work. Fortunately I found a method for Black Knight that doesn't require too much investment. When a solo works, perhaps you could bring other units without weapon to grind HM. The only better thing would be if people found a set of four 4* units (or 5* TT) that can auto a particular GHB with no SI inheritance and minimal SP grinding. But for some units like Odin its probably best to let someone else solo for him. Yea you could replace it with anyone which is nice. Just make sure they're level 40 first for max HM. Yeah I'm trying to have a variety of strats for each day. Haven't figured out a four star strat for today's GHBs, but the Black Knight solo is pretty close to F2P. Neither of the F2P healers (Lissa and Wrys) have a combination of Physic and Imbue. This does not include the time it takes to get a unit up to level 40. Does anyone know if using macros would be against IS's ToS? edit: Someone provided to me the following. 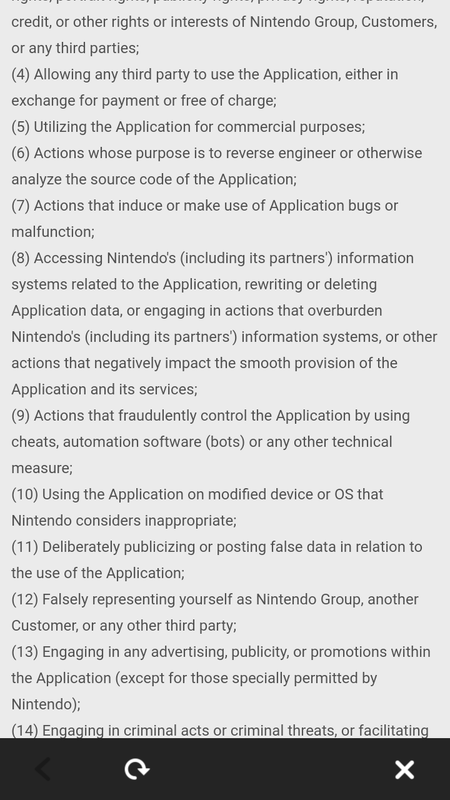 As per (9), macros and bots would not be allowed.